To the class of 2019: I know today is a super super exciting day for you: Today I am going to give you a speech. This question was asked many times before I came here. It was asked many times while I was here and I’m sure it will continue to be asked many more times after today. Having now gone through the entire experience as a student, today I would like to do one thing and one thing only – to answer this question: Why ASB? The answers have changed. In other words, what was true in 1951 is even more true today, and even more true in this part of the world where the answers are changing not by the years or months but sometimes every day. This became evident to us through Action Learning. Having collectively done almost 200 projects across all sectors, industries and countries, we could clearly see that organisations today, big or small, government or private are all struggling with to find new answers to the same old questions in this era of globalization, of the internet of things, of digitalization. What has got us here will no longer get us there. What works in Europe or US might not work in South East Asia. And even within this region, what works in Singapore might not work in Malaysia or Vietnam. And there are simply too many variables to solve for. So, if you ask me Why ASB, the first part of my response is “because the answers have changed”. And it is ASB that equips us with not the answers but the thinking, the methodologies, the moral and ethical principles, the cultural and social awareness, the patience and determination, the sharp and smart skills to figure out these new and constantly changing answers, particularly for this region and to really make major footprint in the rapid development of South East Asia. For that, I want to thank everyone at ASB for affording us this invaluable learning opportunity. Special thank you to Tan Sri Dr. Zeti, to our Board of Governors, to Bank Negara and MIT for your incredible support and to Charlie for your great leadership. My second part of the answer is because ASB is in Malaysia. 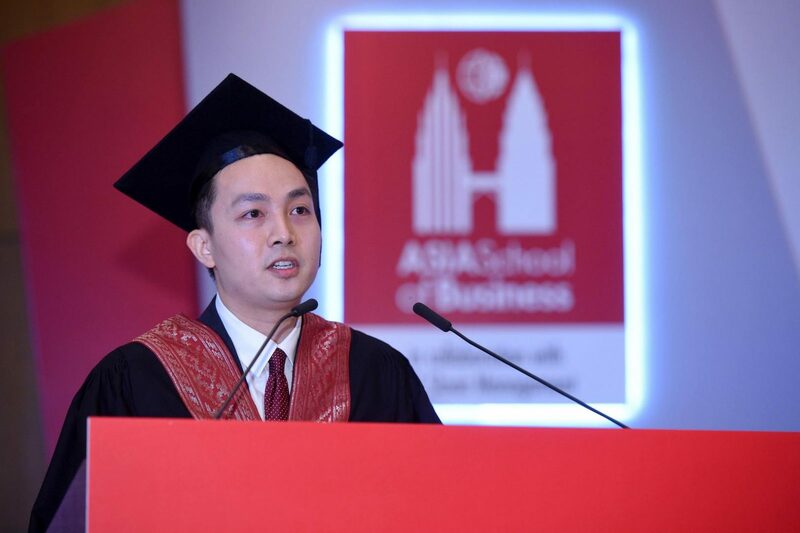 Malaysia might not be the obvious choice for many when thinking about getting an international MBA or just getting business and management education in general. But having been here for 20 months, I know that it has to change. There is no better place to be if you are serious about learning and making an impact in this part of the world. It is not just because of the geographical location, the diversity or the openness of the country, it is also because of the wonderful people that you have here in Malaysia. Malaysia welcomed us with open arms. Your kindness, your extraordinary hospitality, your irreverent sense of humour, your brilliantly unique way of using English – everything has become so familiar and I’ve truly fallen in love with this country. At least I know my love is real when I was on an overseas trip recently and suddenly had a craving for Nasi Lemak …They say home is where the heart is. And if that’s the case, I will be very happy to call Malaysia and KL home. So, thank you Malaysia. Terima Kasih! It is truly amazing how 36 people from 12 different countries in 5 continents with different backgrounds, cultures, religions became so close. We’ve seen each other in our best moments and not surprisingly our weakest moments too. We pushed each other to the limits and beyond. We argued, we fought and we learned from one another. And at the end of the day, we supported each other through thick and thin no matter what. You are among the smartest, funniest and bravest people that I have the privilege to call friends and I cannot be more grateful to be a part of this incredible family. I will miss all of you so dearly. Congratulations class of 2019 and from the bottom of my heart I wish you the very very best.